The early days of additive manufacturing were all about prototyping parts and components in the manufacturing industry. Until the mid-1990s, the sole purpose of the technology was to quickly produce experimental parts for R&D in what became known as ‘rapid prototyping’. The tech evolved throughout the 1990s and became used for tooling and casting. Whilst it revolutionised the way manufacturers could respond to bespoke orders and dramatically reduced tooling costs, its applications were still very much limited to traditional manufacturing industries. Since the late 1990s and early 2000s however AM technology has diversified, developed and emerged as a leading manufacturing process in a wide variety of different industries. It has also found its way into people’s homes, leading some experts to forecast that personal 3D printing services are to completely revolutionise the face of manufacturing forever. No longer will consumers order goods for delivery on-line, or walk into a local store and no longer will manufacturers actually manufacture things. Instead, global manufacturers will transition to become software houses, creating CAD designs that can be downloaded by consumers, who then print out the finished products at home. Now, that sort of technology is still some years away and naturally faces a number of challenges if it is to become the norm. Right now, however, additive manufacturing is being used to produce products cheaper and more efficiently than ever before thought possible. Moreover, complex and intricate designs are being produced using the very latest materials, developed specifically for 3D printers. This article takes a look at some of the industries that are doing just that. Currently representing around 10% of the AM industry, the aerospace and defence industry is a major player in pioneering 3D printing technology. Typical applications include turbines and aerofoils, where lightweight or complex components are the essential. 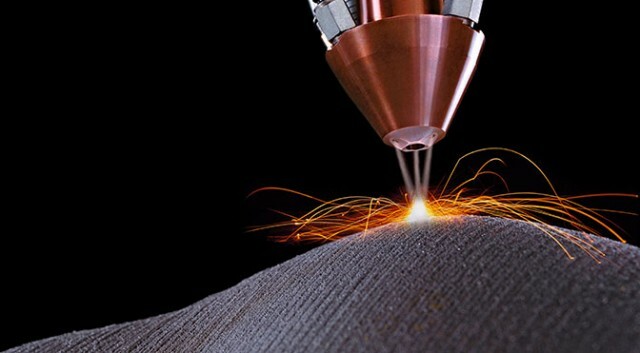 The laser sintering process employed in 3D printing produces high strength components that can weigh up to 60% less than if manufactured using traditional methods. Coupled with the reduced tooling costs, even for bespoke or small production runs, means AM has ‘taken off’ hugely in this sector. One of the major challenges facing the sector is the long service life of aircraft and their parts. Do AM manufactured parts have the longevity required for a fully operational aircraft? Many industry leaders are proving that they do. The ability to produce parts with fewer design restrictions than traditional manufacturing methods is a major factor in the uptake of AM in the automotive industry. Whilst the global dominant forces in the industry are utilising AM technologies to produce cutting edge designs, AM is lowering the barriers to entry for many smaller manufacturers across the world. Again, low tooling costs are also playing a major part, allowing niche manufacturers to produce smaller batches of cars at a fraction of what the cost would have been only a decade ago. AM is also revolutionising the way car electronics are manufactured and the latest in material engineering mean multi-material parts are now readily available. This has a number of implications, including safer, cleaner and lighter systems that can power our vehicles more efficiently than ever before. The decrease in tooling time brought about by AM also makes for far shorter lead times, as the time from design to first production has been slashed. Lighter components and the possibility for local production on smaller scales could also drastically reduce handling costs and the carbon footprint of manufacturers. Arguably the most exciting advances in AM are currently being made in the medical industry where bio-medical implants and prosthetics are being produced on scale for the very first time. Experiments are ongoing for the production of living tissue, including human stem cells, which could revolutionise health care across the world. Currently, bio-medical devices such as hearing aids, dental crowns and surgical tools are all prime candidates for AM production due to their high value, relatively small size and requirement for complex or precise design. The next generation of 3D printing is predicted to take this to the next level, with entire human organs available to print. Low tooling costs also suit the medical industry nicely, as parts bespoke to individual patients can easily be manufactured. There is also the possibility to produce parts cheaply in parts of the world with poor levels of healthcare, potentially changing the face of aid relief in parts of the world like sub-Saharan Africa.